Received 2014 September 17; Accepted 2015 January 24. 1. Song SS. Sergeant says unit blanked him [Internet]. Seoul: The Korea Herald; 2014. [cited 2014 Jun 30]. Available from: http://khnews.kheraldm.com/view.php?ud=20140630001287&md=20140703005142_BK. 2. Yonhap News Agency. Defense chief apologizes over draftee’s shooting spree [Internet]. Boston (MA): GlobalPost; 2014. [cited 2014 Jun 27]. Available from: http://www.globalpost.com/dispatch/news/yonhap-news-agency/140627/defense-chief-apologizes-over-draftees-shooting-spree. 3. Doo YP, Song JK. A study on efficient operation plans of emergency medical technician. Korean J Mil Med 2006;37:156–164. 4. Kim JH, Jang BK. Study on efficient operation policy of emergency medical technician. Korean J Mil Med 2010;41:97–114. 5. Park KG, Kim KH, Jang BK, Kang JK, Kim JH, Lee MH. 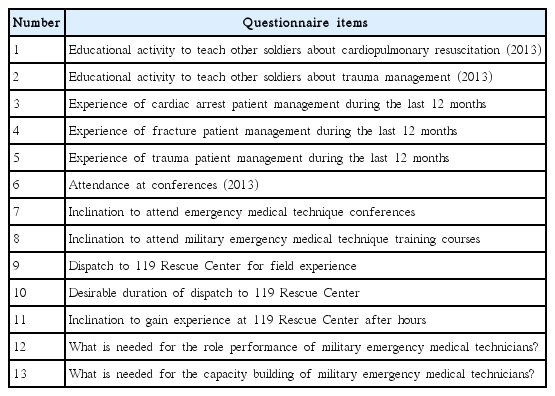 The study on the efficient application of emergency rescue workers: focused on Army Unit. Korean J Mil Med 2011;42:133–145. 6. Calderbank P, Woolley T, Mercer S, Schrager J, Kazel M, Bree S, Bowley DM. Doctor on board? : what is the optimal skill-mix in military pre-hospital care? Emerg Med J 2011;28:882–883. http://dx.doi.org/10.1136/emj.2010.097642. 7. Andersson SO, Lundberg L, Jonsson A, Tingström P, Dahlgren MA. Interaction, action, and reflection: how medics learn medical care in the Swedish Armed Forces. Mil Med 2013;178:861–866. http://dx.doi.org/10.7205/MILMED-D-13-00048. 8. VanRooyen MJ, Erickson TB, Cruz C, Levy P, Isaacs JK. Training military medics as civilian prehospital care providers in Southern Sudan. Prehosp Emerg Care 2000;4:65–69.